We all know corporate entertaining can often err on the side of... how should we put it? Oh yes, dull. So we've decided to do something about that, with the magic of our RIB boats. We have teamed up with Live in the City, who promise to entertain and enthral whilst offering a completely new way to experience the capital. Live in the city specialise in sightseeing based events, with a bit of a twist. And that's where we come in... Our 'Corporate Adventure Tours' are just the thing if you're looking to put the fun back into a corporate day out. Whether you're planning a little teambuilding, want to say thanks to a few star employees or offer an employee incentive that's guaranteed to get results, look no further! 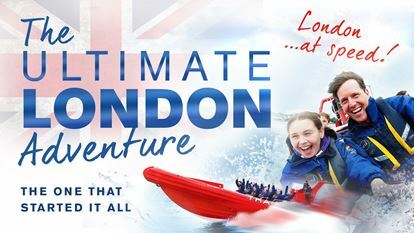 Get the adrenaline pumping on board London RIB Voyages to celebrate that killer deal, bond with new colleagues or just enjoy a breath of fresh air on the Thames. You'll see the city in a whole different light. Our corporate entertainment packages will see you speed through London at up to 35 knots as the Thames is eaten up by 400hp engine power. Whilst on board you'll enjoy the informative banter of our award-winning comedian guides, whose tours can even be tailored to make your trip a little more personal! Our private charters are available 365 days a year, and are great whatever the weather. We'll even provide all the gear to keep you warm and dry and ensure that your day on the water is the best it can be!